California is trying to legalize small-scale sale of food made by home cooks. But will it allow tech startups to treat home cooks like Uber drivers? A few years back, Christina Nelson, an office manager and student, craved a more meaningful life. She soon joined the Slow Food movement in San Diego, and began to experiment with cooking local and sustainable meals prepared in traditional ways. Eventually, she learned how to make naturally leavened bread using locally milled whole grains. She loved the whole process and decided to make a career out of baking. “It was something I’d always thought about as a kid, [that] it would be fun to run a café,” Nelson said. She landed a job working in a commercial bakery in Los Angeles, but the grueling commute from her new home in Orange County curtailed that dream. Deciding to make a go of it on her own, Nelson rented space in a shared commercial kitchen. But the hourly rental fees added up quickly during her 12-hour baking shifts, making for little, if any, profit. Fortunately, Nelson could apply for a cottage food permit, thanks to a 2012 California law allowing home cooks to sell some non-perishable foods—granola, candies, baked goods—out of their home kitchens. The process that took months, and included an inspection visit from a local health regulator, and once she was permitted, she launched Demeter Bread and Pastry, and began selling bread, cookies, and other baked goods at the Santa Ana farmers’ market. Now, Nelson sees another business opportunity in selling hot, healthy, and locally sourced lunches at nearby business parks, but she can’t do that under the current law. But that could change. In February, California Assemblymember Eduardo Garcia introduced the Homemade Food Legislation Act (AB 626), which would permit the sale of prepared meals and other foods from small-scale home kitchen operations. Last week, AB 626 passed the state’s Health Committee with a vote of 12-0, with three members abstaining; the full Assembly is set to vote on the bill before May 26. And while Garcia hopes the bill can be an “important lever of economic empowerment for immigrant, minority, and other vulnerable communities,” it’s not without its opponents. The Sustainable Economies Law Center (SELC), the group that wrote the 2012 bill, worries that the new legislation could give web platforms like Josephine, and others tech companies like it on the horizon, too much power over home cook. She is one of the state’s many home cooks, a significant percentage of whom are women and immigrants, who could benefit from the new legislation, which would legalize the small-scale sale of homemade foods like tamales and other hot foods. Last year, the hazards of participating in the informal food economy came to light when the story of Mariza Ruelas went viral. The Stockton mom of six was threatened by authorities for selling homemade ceviche through a private Facebook food swap group. Ruelas, no surprise, supports the new legislation. Angela Janus, executive director of ShareKitchen and a consultant with the Coachella Valley Small Business Development Center, thinks the proposed law is great, especially if it means streamlining the permit process while empowering small business incubation for those who can’t operate legally under existing cottage food laws. When more people can legally start small food businesses at home, the idea goes, they’ll also have a legitimate stepping stone to successful catering or commercial food operations. “There are a lot of traditional Hispanic foods being prepared in home kitchens and shared in local communities that are unregulated,” said Janus. She adds that the legislation could help to address current issues of safety, sanitation, equity, and zoning. The Uberization of Homemade Food? The homemade food legislation still has a long way to go. In its current form, it’s only a legislative declaration of intent or a “spot bill.” It doesn’t lay out any specifics about training requirements, or what the actual permit process and registration might look like. “Essentially, the bill seeks to create a new registration or permit process that would allow home cooks to sell directly to customers while complying with a series of health, safety, sanitation, and education guidelines,” said Matt Jorgensen, the co-CEO of Josephine, an online food sales platform headquartered in Oakland. Josephine sponsored the new legislation after cooks in several Bay Area cities selling meals through its site received cease-and-desist orders from health regulators last summer. The company continues to operate in Oregon and Washington. Josephine made the foray into the legislative process early last year, but the bill’s first iteration was killed on arrival, shot down by the California Conference of Directors of Environmental Health (CCDEH). “We hadn’t worked with them to develop a policy. They told us that if there was going to be some sort of legitimization of this informal economy, then they needed to be part of it, and it needed to be a new permit process,” said Jorgensen. Within months, the health regulators developed an ad hoc committee to develop the language of the legislation and permit process. At the same time, Josephine assembled a working group made up of home cooks, legal experts from the UCLA and Harvard Food Law Clinics, and other stakeholders including the California Food Policy Council, the Cottage Food Operator’s Association of America, and more. Once the stakeholders were in place, Josephine’s representatives connected with Assemblymember Garcia, who had already expressed a desire to revisit homemade food laws as a way to develop his policy agenda of economic empowerment of minority populations. Early on, Josephine also worked closely with SELC and Christina Oatfield, a policy director with the organization, who was a key architect of the 2012 Cottage Food Act. However, SELC recently stepped away from the new, expanded legislation, saying they were not comfortable with the potential “Uberization” of food posed by the participation of companies like Josephine. 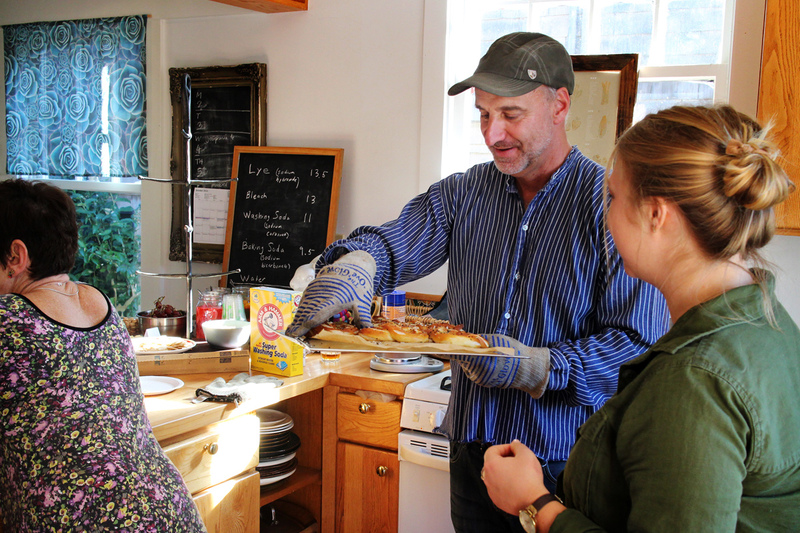 According to Oatfield, SELC will only support further homemade food legislation if it ensures some form of community ownership of any web platforms involved in the sale of homemade foods. They’d like to see a provision that limits that ownership to cooks and/or eater-owned cooperatives, nonprofit organizations, or government agencies. The model they proposed is based on the way certified farmers’ markets are run in California. “When you have a whole industry that’s operated by stakeholder groups—farmers, home cooks, nonprofit organization groups, local governments—it really changes the dynamic and changes the priorities for the industry—compared to tech companies that are for-profit and backed by venture capitalists out to make huge profits,” explained Oatfield. It’s not yet clear how such a law would be enforced. It could be through individual court actions, or through a limit on the types of web platforms that receive permits from environmental health regulators at the county or city level. What is clear is that a company like Josephine, as it’s currently structured, would not be allowed to operate legally under SELC’s proposal. At play, says Oatfield, are important questions about whether home cooks will be considered independent contractors, and whether they will have any protections under employment law. There are also questions about whether the cooks working with online platforms will be pressed to cook more food faster or with lower-quality ingredients, either of which could affect food safety. “We don’t know what’s going to happen, but looking at other industries where tech has come in and shaken things up, we have a lot of reasons to be concerned,” added Oatfield. Last August, Jorgensen addressed some of these issues in a statement. As he explained it, Josephine takes a 10 percent cut of a cook’s sales. In addition, Josephine has established a Cook Council to act as a communication bridge between the company and the cooks; a representative from the council holds a seat on Josephine’s Board of Directors. Josephine co-CEO Charley Wang has argued from the start that it’s possible for a for-profit tech company to empower and give agency to their providers rather than exploiting them for maximum output and profit. In exchange, cooks—some of whom lack the language and/or technology skills to market themselves—get an established platform that, in theory, gives access to the support and resources they need to sell their food to customers. Others agree with Wang. A self-professed “great fan of cooperatives,” Peter Ruddock, a coordinator with California Food Policy Council and Slow Food California, says linking homemade food and cooperatives complicates the legislation without offering significant benefits. Furthermore, he says it was easy for Uber for commodify rides, which aren’t all that unique. It’ll be harder for a tech company to commodify homemade meals, which vary by geography, ingredients, and individual chefs. In other states, some cooks have already turned to tech companies as support for their home cooking endeavors. In addition to Josephine, Meal Surfers, MyTable, and Umi Kitchen are hoping to engage home chefs in Los Angeles, New York, Toronto, and beyond. “I wouldn’t have been able to start anything like this on my own,” said Chitrakar-Walson. This bill would be huge and open doors to thousands of California home Cooks, bakers and Specialty Foods and diets like vegan or paleo Foods. 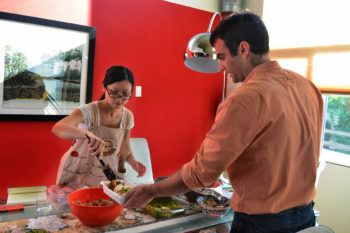 SwankCook.com is another food sharing site for home cooks in San Diego and Los Angeles areas. Our home cooks are excited about the possibilities of the selling food on our platform and other platforms online but are worried about the laws.